This is a monster of a question that never seems to find extinction. The Triumphal Entry that could have been!?! 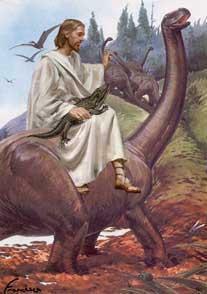 ?Through the process of carbon DNA glycosonarisation, we are able see that dinosaurs were allergic to carrots. The presence of carrots in their stomachs (see the silly answer “Why are there always carrots when . . .” somehow made their ears ring. And being so big, it was more a fire truck’s wailing siren than the genteel ringing humans encounter. Most had either really short arms or stumpy legs, preventing them from getting a giant cotton bud to poke around in their ears and satisfy their curiosity. Of course, having this ringing in their head all day made them very grouchy indeed. Needless to say, no-one likes to be around an irritable dinosaur. It just brings your own mood down. Therefore, the dinosaurs became very lonely and depressed too—not having any friends as such. They resorted to bullying the other animals in an attempt to be accepted. But that only brought a few shallow friends out of fear—not true friends. Come time for the flood, Noah put out an audition call for all the animals. He had a place for two of every animal in his floating barnyard. There were animals queuing back for kilocubits! Because of the ringing in the ears, the dinosaurs didn’t hear about the auditions. They were also used to people just walking away from them too, so didn’t think anything was up. No-one wanted to tell them about it either, for fear of the crankosauruses biting their head off. Eventually, Noah herded two of each animals in, plus a few extra animals for cleaning purposes and the poor humagadocuses were left behind. Whales were the only dinosaurs to survive. Even today, if you put a microphone in the water you can hear them whining due to the ringing still going on in their ears! Random fact about dinosaurs: While most dinosaurs were really tall, none ever played professional basketball.